Our Lady of Deliverance, Empress of China. In 1900, the Catholic Church was healthy and growing in China. There were forty bishops, about 800 European missionaries, 600 native Chinese priests, and the number of native Catholics throughout the whole of China proper was estimated at 700,000. It was during this time that the Boxer Uprising (1898-1900) started which ushered in a period of animosity against all things European. The cathedral, which was the Lazarists’ usual place of residency, was besieged by 10,000 Boxers and soldiers from the regular army. Behind the walls of the church, were over 3,000 Chinese Catholics, 30 French seamen led by a 23-year-old Lt. Paul Henry (who died in the siege,) 11 Italian soldiers led by a 22-year-old Lt. Olivieri, and numerous French and Chinese priests and sisters. This siege resulted in the deaths of more than 400 people. Over the two month siege, the Catholics endured continuous bombardment, mine attacks, flaming rockets, and starvation. Many of the children died from smallpox. Among the admirable figures in the siege was Sister Helen de Jaurias, the Superior of the Sisters of Charity in Beitang, of whom it is said that she possessed the virtue and character of their foundress, Saint Louise de Marillac. Her siege diary provides proof of this: despite having to lodge and feed 1,800 women and children, she overcame the burden of old age and fatigue, she recorded the daily events of the siege until her death on August 20. She went, as she expressed it, “to observe from Heaven the triumph of Holy Church and the conversion of China.”2 A few days before her death, a company of French marines arrived to rescue the heroic defenders of Beitang. 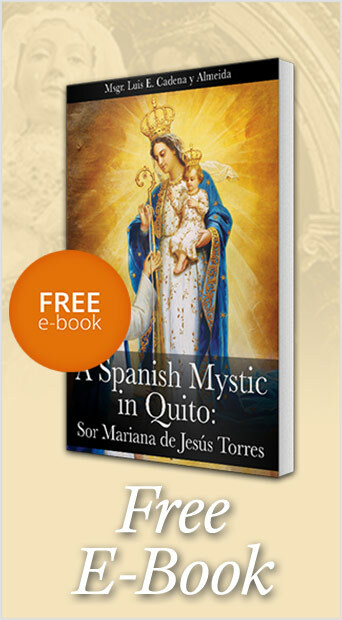 Their miraculous survival was attributed to the appearance of a woman in white, Our Lady of Deliverance. Bishop Favier had a chapel erected in thanksgiving, in the church of Beitang in her honor. 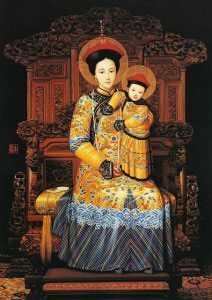 She is represented as the Empress of China holding in her arms the Child Jesus, Who is depicted as an imperial prince. Alphonse Favier, Edited by Joseph Freri. The Heart of Pekin: Bishop A. Favier’s Diary of the Siege, May-August 1900. Boston: Marlier, 1901. Page 9 & 10. Henry Mazeau, The Heroine Of Pe-Tang; Helen De Jaurias, Sister Of Charity 1824-1900. Sr. Helen de Jaurias died on August 20, 1900. J-M Planchet C. M., Documents sur les martyrs de Pekin pendant la persecution des Boxeurs, Peking, Imprimerie des Lazaristes, 1920, p. 101. This entry was posted in About Our Lady and tagged About Our Lady, apparition, Beitang, bishop, Blessed, Boxer Rebellion, boxers, Cathedral, Catholic, Child Jesus, China, Chinese, Church, Crown, death, Empress of China, European, Favier, foundress, God, hatred, Helen de Jaurias, Imperial, Lazarist, life, Louise de Marillac, martyr, massacre, miraculous, missionary, Our Lady of Deliverance, Paul Henry, Peking, Pierre-Marie-Alphonse Favier, priest, Prince, Providence, religion, revolt, Saint, siege, Sister, Sisters of Charity, Superior, TFP, Uprising by A Devotee of Our Lady. Bookmark the permalink.